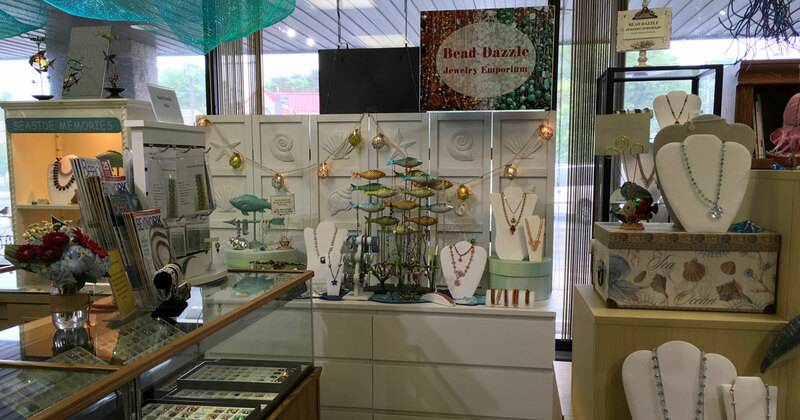 Jean Suleski, owner of Bead Dazzle in Point Pleasant, New Jersey, is a prime example of all that the hardworking local bead store (LBS) owners and staff do to provide and maintain your “happy place.” She shared her insight with us! Jean Suleski, owner of Bead Dazzle in Point Pleasant, New Jersey. Your local bead store knows that if the customer cannot find all she needs for her planned project, that customer (who may have traveled far!) may be gone for good. That’s why bead stores offer a wide selection of seed beads, crystals, freshwater and glass pearls, accent beads, gemstones, and fittings, in every size and color. 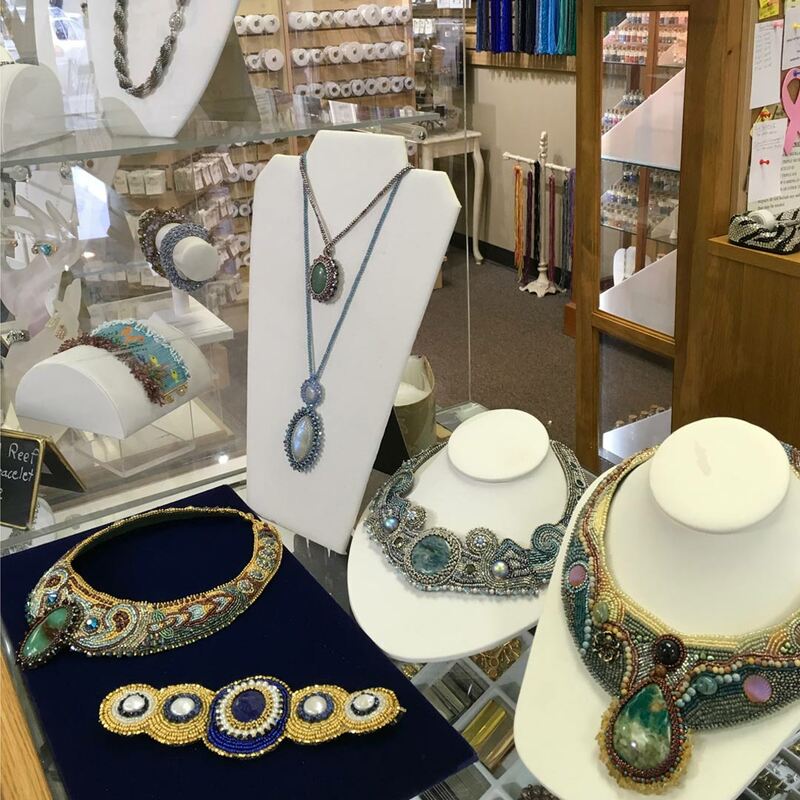 Bead store owners are the first to spot trends and the next “hot” shape in beads and offer classes and workshops that open customers’ eyes to the possibilities these novelties offer. The owners and staff of your LBS dress up the space they have and fill it as full as they can get it. You can cram a lot of beads into a small space! Jean’s husband Charlie is a professional display designer who gives the shop a new look at least four times a year. He is also the genius who finds room for “just one more” inventory item when we swear the shop is bursting at the seams. Local bead stores are just that– local! They bring local flavor to the store, and they are tapped into their community’s trends and popular activities. 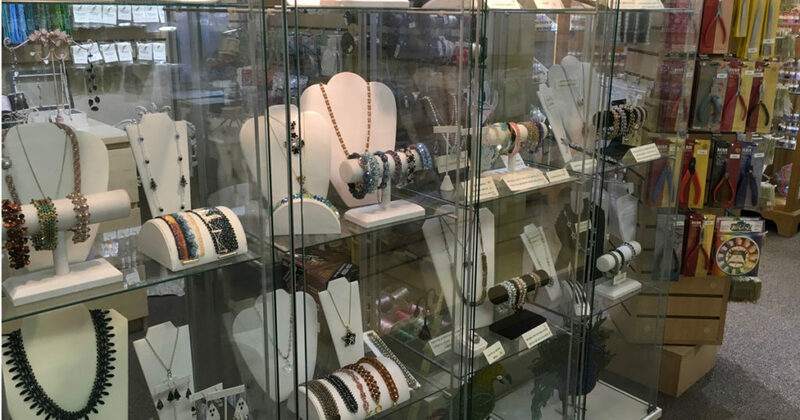 With its seashore location, Bead Dazzle stocks a wide collection of beads, charms and findings with an ocean theme, and its teachers design kits and classes in which the sea, marine life and beach culture are featured. Who wouldn’t want to bead by the beach? Everyone who works or teaches at your LBS is able to answer basic beading questions and to give quick demonstrations and advice. Friendly, free support is there for the asking – take advantage of their skills and they will be happy to help you! You can get way more one-on-one instruction and face time with instructors when you find them at the source! Check out your local bead store’s class offerings and you’ll be surprised at how affordable it can be to learn from the masters. 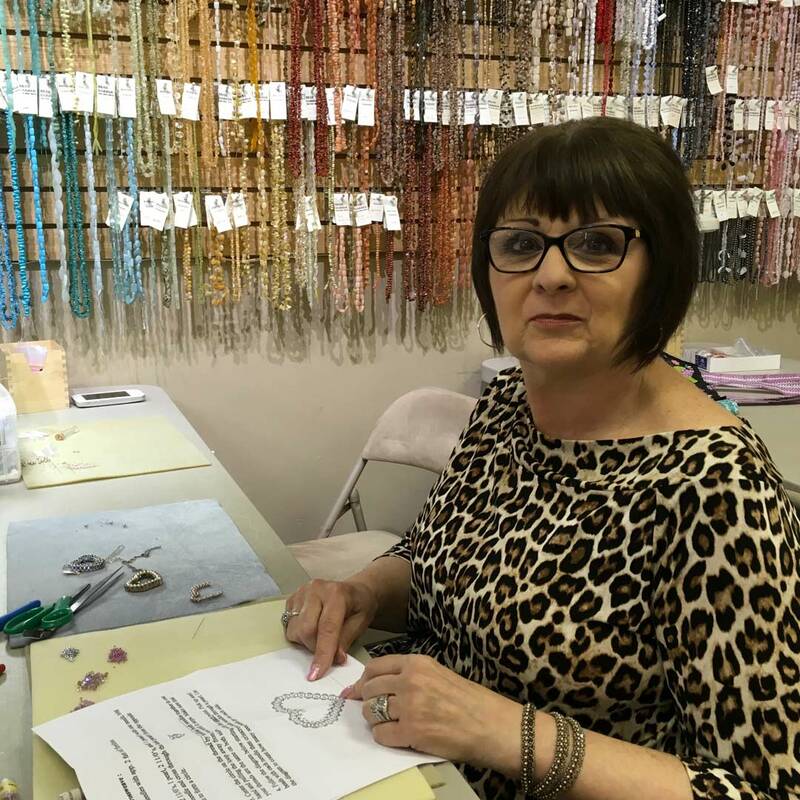 Bead Dazzle offers one-on-one introductory classes in beading and wirework, and a wide menu of beginner and intermediate level classes that changes four times a year. Special advanced classes, sometimes with celebrity master teachers, stretch our skills and refine our design sense. Monthly group workshops and “Take One on Us” freebies are always full and always fun. At these special sessions, there is sharing of advice and stories as well as expert instruction. Everybody’s play-money budget is tight– you can make your beading dollar stretch by following your local bead store on their email list and social media to keep up to date with the sales and promotions they have. LBS’s promote their sales well ahead of time so that all of their customers are aware. Don’t miss out on a great deal! Four times a year, Bead Dazzle runs weekend sales with great discounts, door prize raffles and free gifts for all. Often, the sale days feature vendors’ trunk shows, each with an astounding choice of cabochons, pearls, specialty beads or fittings. Another reason to stay in touch with your LBS is to stay in-the-know about special events. 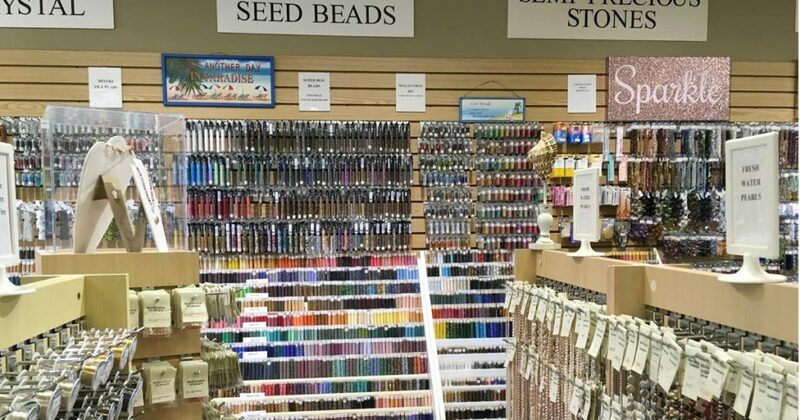 Organized trips to bead shows, community events that they are participating in, celebratory events like store-opening anniversaries, and other group activities are a great way to make friends with people in your beading community, and you can only get that from your local bead store. The entire Bead Dazzle community looks forward to the annual Christmas Ball Bead-In and the elegant Super Bowl Sunday special. We have arranged bus trips to bead shows, hosted chamber music performances, and sponsored community activities. In the end, it’s all about friendship, enthusiasm and the desire to share the craft. Bead Dazzle offers instant gratification—you can find what you are looking for!—expert advice, innovative ideas, and a very fine cup of coffee. Over the beading table, all beaders of goodwill, novice or expert, are welcomed and welcoming. So, ladies (and the occasional gentleman), come on in and enjoy all your local bead stores have to offer. They are a valuable resource! We would love to hear what you love about your LBS or what you offer in your LBS that’s working for you. Please leave a note in the comments. I had the pleasure of visiting Bead Dazzle when I was at the Jersey Shore area for a wedding in May. I had a few extra hours to spare and visited there. It is an awesome shop and the people there were really helpful! I also would love for you to point out in future articles that very often the prices at local shops are less expensive than those on the Internet. My local shop, BEADS!, in Tampa not only sells ALL the Delica 11/0 colors, but also offers them for less than online shops. I keep a spreadsheet to track the price per gram for my purchases and BEADS usually beats all others!